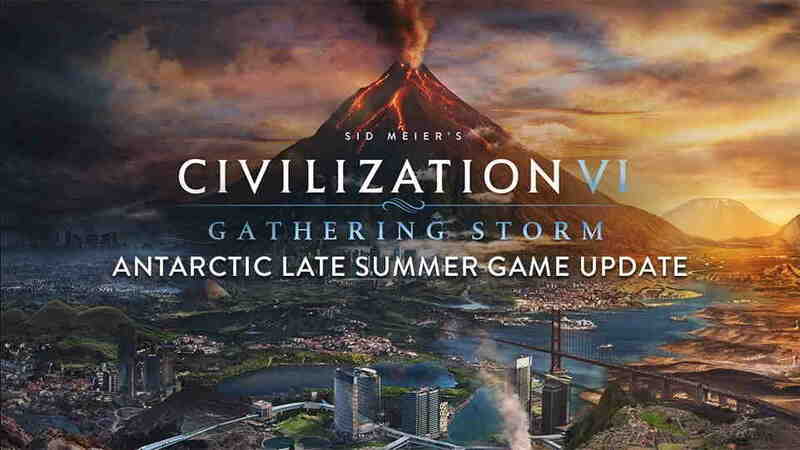 Firaxis Games, the developer of the popular turn-based strategy game Civilization VI has released the first major update for Sid Meier’s Civilization VI: Gathering Storm’s Antarctic Late Summer Game Update and it’s now available to download. Firaxis has also released the full patch notes for the update and the preview video of the latest update. The latest Civilization VI: Gathering Storm’s Antarctic Late Summer Game Update as its main key features include New and improved version of Map Pins, that includes pin icons for many new specific markers, Districts, etc. Players can now search for map items via text search and have them highlighted on the map. Below you can find the summarized version of the latest Civilization VI: Gathering Storm’s Antarctic Late Summer Game update patch notes. [ALL GAME VERSIONS] Map text search: Located on the mini-map toolbar. Players can now search for map items via text search and have them highlighted on the map. For example, type “Iron”, or “Knight”. Includes search history, search suggestions, and “go to” buttons. Maori: Toa ability no longer stacks and Strength is reduced to 36. Spain: Mission: +2 Faith; +1 Food, and +1 Production if on a different continent than your capital. +1 Science for every adjacent Campus and Holy Site. Increased chance of Storms and Droughts per degree of temperature rise is no longer 20% for all events. Now it does not increase the chance of the weaker type of each storm/drought at all but instead boosts stronger type by 50%. At Phases, V and above yields previously added to the map can be stripped off as Storms and Droughts pass over (chances increase as you move to later phases). Allow a single player’s CO2 footprint to go negative (if they have run the Carbon Recapture project but never generated much carbon). Hence one player can clean up the other players’ mess. Reducing the power of Royal Society Government District Building (reducing percentage-per-builder-charge from 3 to 2). Dam districts now provide healing if plundered. Pillaged Reactors cannot trigger a nuclear accident. Completing the ‘Recommission Nuclear Reactor’ project will also ‘un-pillage’ it. Reduce the base cost of Naturalists from 800 to 600 to make them compete better with Rock Bands. Make sure Barbarians can’t spawn GDRs. [ALL GAME VERSIONS] Air unit and Anti-Air unit combat strength balance changes propagated to the base game. Add Walls to the City States on Diety and Immortal games. Add additional melee units to the City States at higher difficulties. The Upper case ” i “, lower case ” L”, and number 1 all look identical when observing the Join Code in the Game Summary of the Play By Cloud Staging Room. – Increased size of the font so unique aspects of gylphs can be determined. Add secondary color to jersey selection color collision detection. Now jerseys are only considered to have collided if BOTH primary color and secondary color collide. Jerseys with similar or identical primary colors are now allowed if the secondary colors are very different. Climate Overview: Add icon, the tooltip for fertilized tiles lost due to weather events. Increase the value of Diplomatic Favor. Limit number of items desired in a trade. Set minimum value for traded items. Don’t try to trade more of a Luxury resource than the human is already importing. Correctly value maintenance resources when calculating trades. Reduces possible exploits with the resource for gold trades with the AI. Fixes to trades for strategic resources – Stop paying full value for them when you’ve got a decent stockpile, not just at the stockpile cap. Reduces possible exploits with the resource for gold trades with the AI. Boost Wonder Obsessed AI’s desire for Wonders in later eras. Embarked units know they are under threat from naval units – Improve protection of units while on city assault. [XP1] Improve ability for AI to use Warrior Monks militarily – Add additional war footing condition. Avoid advancing your Power Plant if you don’t have resources for it. Increase the odds of aggressive civs making encampments. [XP1, XP2] Reduce the value of supply convoys, they were heavily overvalued by AI. The full patch note details can be found here.